Firefish Goby, also sometimes called the dartfish is a type of saltwater species famous for its magnificent display of beautiful color. The fish can be easily recognizable based on its red and orange tail fin and also with its sharp and extending dorsal fin. Unlike common tropical fish species body shape, firefish goby is unique with its long tubular appearance that somehow allows the fish to navigate and move fast in the waters. Caring for your pet firefish requires that the temperature of the water to be maintained at around 73 to 78 degree Fahrenheit and the pH of the water to be slightly alkaline about 7.5 to 8.0. As with other saltwater fish, the right water salinity should be within 1.020 and 1.025. Firefish goby is known to be a timid fish species and it takes time for the fish to get itself adjusted to a new tank. Sometimes, when you approach the fish in a sudden spontaneous manner, it will get startled and dart across the water in fear. In certain extreme cases, there are even stories that relate how the fish even jump out from the tank when it has the sense of insecurity. Therefore, home aquarium that houses the fish should best equipped with a hood cover and inside it, have reefs and corals to provide sufficient hiding place. 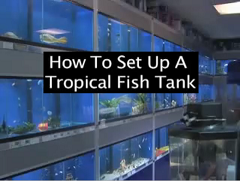 Find out also on how to create your new fish tank. If you have a new pet firefish goby and intend to keep it for long, make sure that you understand its dietary requirements. Basically the species is a carnivorous type that accepts only certain type of foods like brine shrimps, chopped up prawns and also slices of fish meat. Although it will eat fish pellets as well, be forewarned that prolonged diet based on processed food can cause your pet to be malnourished and suffer from discoloration. Try to provide variety of food offerings and watch closely whether they are eating, else if they reject the foods, it may be a sign that you have an unhealthy fish. Read further regarding the details on how to maintain a healthy pet fish. Red firefish goby is an egg depositor and it is quite difficult to get the fish to spawn in artificially created tank environment. So far, even the fish experts have not been able to correctly identify which one is the male and which one is the female and attempts to breed the fish is best leave to the experts. Overall, if you have an established saltwater tank filled with other community fish, your pet will not have any issue getting along with the other fish species. However, caution must be taken to monitor the fish whereby sometimes it will exhibit aggressive behavior towards its own kind, but with the rest of the tank mates they seem to be getting along pretty well.